Lambert Kay Fresh 'n Clean 2 in 1 Baby Powder Scent Conditioning Shampoo cleans and conditions the hair leaving it lustrous and manageable. Aloe vera has also been added to soothe the skin. Formulated to match the pH balance of a pet?s skin and hair. 2 in 1 formula cleans and conditions in one easy step leaving a long-lasting scent. Protein penetrates the hair fiber to strengthen, repair & protect the coat. Goes deep to moisturize the skin with the hydration benefits of Vitamin E & Aloe. pH balanced for pet's skin and coat Builds body and helps combat mats & tangles. Fresh 'n Clean scented shampoo cleans away dirt and leaves a long-lasting fragrance that clings to hair for up to two weeks! The pH balance is compatible with the natural pH balance of the pet's skin and coat. This shampoo formula includes aloe vera to soothe the skin and extra conditioners to help make the coat shiny, manageable and free of mats and tangles. It all adds up to a pet that smells as great as it looks and feels, a pet you'll be proud to call your best friend. Ingredients: Cleansing agents (sodium laureth sulfate, disodium oleamido MEA sulfosuccinate, cocamidopropyl betaine), conditioner (cocamide diethanolamine), soothing agent (aloe vera gel) and long-lasting fragrance. Lambert Kay Fresh 'n Clean Conditioning Shampoos cleans and conditions in on easy step, leaving a long-lasting scent. Colloidal oatmeal & baking soda soothes skin and controls odor. Your pet's skin will be moisturized with hydration benefits of vitamin E and aloe. 2 in 1 formula cleans and conditions in one easy step leaving a long-lasting scent. pH balanced for pet's skin and coat Blend of natural colloidal oatmeal and baking soda soothes skin and controls odor. Lambert Kay Boundary Dog Repellent a training aid for your pet. Will repel dogs and cats for up to 24 hours when applied daily. Keeps pets away from furniture, carpet, trees, shrubs, garbage cans and bags, and other forbidden areas. Aerosol spray contains no CFCs or other ozone depleting substances. Ingredients Active Ingredients: methyl nonyl ketone 1.9%, related compounds 0.1% Other Ingredients: 98% Keep out of reach of children. Precautionary Statements Hazard to Humans and Domestic Animals. Caution Harmful if absorbed through skin. Avoid contact with eyes, skin or clothing. Prolonged or frequently repeated skin contact may cause allergic reaction in some individuals. Wash thoroughly with soap and water after handling. First Aid: If On Skin: Wash with plenty of soap and water. Get medical attention if irritation persists. Environmental Hazard Do not apply directly to water. Directions For Use: It is a violation of Federal law to use this product in a manner inconsistent with its labeling. Shake well before using. Use Restrictions: Do not use in commercial food processing or preparation areas. In the home, cover all exposed food, food processing surfaces, and utensils during treatment. Do not spray food or feed crops. For both indoor and outdoor situations, use training whenever possible, including positive (praise) and negative (sharply spoken work backed up with disciplinary action) reinforcement. This product repels dogs and cats for up to 24 hours when applied daily. Keeps pets away from furniture, carpet, trees, shrubs, garbage cans/bags and other "forbidden areas". Lambert Kay Fresh 'n Clean Snowy-Coat Shampoo is formulated especially for adding luster to white coats. It fights yellow discoloration and heightens a coat's natural sparkle without bleaching. It contains special conditioner, too, that builds body and helps stop tangles, leave a handsome sheen and prevent skin and coat dryness. The formula is pH balanced to match the pH of pet's skin and hair. Aloe vera has also been added for its skin-soothing benefits. Ideal for pets with full or partially white coats and especially pets with discoloration around the muzzle. Lambert Kay Boundary Cat Repellent a training aid for your pet. Will repel dogs and cats for up to 24 hours when applied daily. Keeps pets away from furniture, carpet, trees, shrubs, garbage cans and bags, and other forbidden areas.Aerosol spray contains no CFCs or other ozone depleting substances.Ingredients Active Ingredients: methyl nonyl ketone 1.9%, related compounds 0.1%Other Ingredients: 98%Keep out of reach of children.Precautionary StatementsHazard to Humans and Domestic Animals.CautionHarmful if absorbed through skin. Avoid contact with eyes, skin or clothing. Prolonged or frequently repeated skin contact may cause allergic reaction in some individuals. Wash thoroughly with soap and water after handling. First Aid: If On Skin: Wash with plenty of soap and water. Get medical attention if irritation persists.Environmental HazardDo not apply directly to water. Directions For Use: It is a violation of Federal law to use this product in a manner inconsistent with its labeling.Shake well before using.Use Restrictions: Do not use in commercial food processing or preparation areas. In the home, cover all exposed food, food processing surfaces, and utensils during treatment. Do not spray food or feed crops. For both indoor and outdoor situations, use training whenever possible, including positive (praise) and negative (sharply spoken work backed up with disciplinary action) reinforcement. This product repels dogs and cats for up to 24 hours when applied daily. Keeps pets away from furniture, carpet, trees, shrubs, garbage cans/bags and other "forbidden areas". Lambery Kay Boundary Dog & Cat Repellent Granules will keep dogs and cats away from trees, shrubs, flower beds, garbage cans and bags, and other "forbidden" areas! Boundary is an effective deterent of unwanted dog or cat activity in varous areas around your home. This is a Lambert Kay product Active Ingredients: Methyl nonyl ketone .... 1.9% Related compounds .... 0.1% Other ingredients ...... 98% Directions: *For outdoor use only. Do not apply granules directly to foliage of shrubs or to ornamental, soft-bodied plants. Do not apply on or near food crops. Use training whenever possible including positive and negative reinforcement. This product repels dogs and cats for up to 24 hours under ordinary weather conditions. Keeps frequency of digging by cats in flower gardens. Pretreatment Directions: Stray animals are frequently attracted to areas where pets have soiled with feces or urine. To discourage repeat visits, remove any droppings and clean with water. Application Directions: Using gloves, lightly sprinke granules directly from the container or using a spreader at the rate of 1 lb. per 250 sq. ft. Apply as a border to the item to be protected. Retreatment Directions: Repeat daily, or as necessary, until undesirable habit is broken, repeat applications after rains. 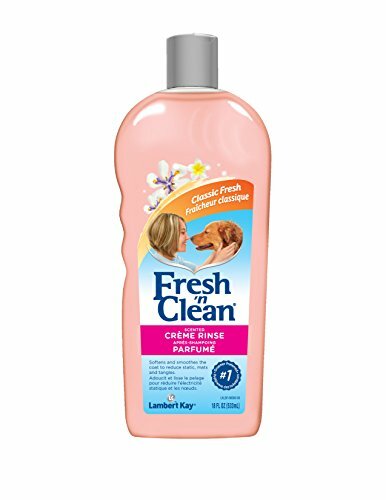 Fresh n Clean dog creme rinse creates a pleasing fragrance that lasts from one grooming to the next. The aroma refreshes instantly just by wiping the coat with a moist towel. Helps keep dogs smelling fresh for weeks. Fresh n clean creme rinse increases manageability and aids in removal of mats and tangles. It contain cetyl alcohol, stearalkonium chloride, hydroxyethylcellulose, aloe vera gel, fragrance. Dilutes 7:1. Available in 18-ounce. Measures 9-inch length by 1-4/5-inch higth by 3-1/2-inch width. Ingredients are Cetyl alcohol, stearalkonium chloride, hydroxyethylcellulose, aloe vera gel, fragrance. Make light-colored coats sparkle and shine with Lambert Kay Fresh 'n Clean Snowy-Coat shampoo. Enhances the natural color of a dog's coat without bleaching. Shampoo contains conditioners to leave coats soft and manageable. Ideal for white, creams, and light-color coats. Leaves a mild coconut scent. Shampoo comes in an 18 ounce bottle. Ingredients are Sodium Laureth Sulfate, Cocomide Diethanolamine, Glycol Distearate, Aloe Vera Gel, Fragrance. Directions for use - Wet coat with warm water. Pour shampoo along pet's back. Work shampoo into coat. Add more if needed. Rinse. Shampoo again. Rinse until water is free of suds. Measures 9-inch length by 1-4/5-inch height by 3-2/7-inch width. Fresh 'n Clean flea and tick conditioning shampoo is formulated with natural pyrethrins to quickly kill fleas and ticks without harsh chemicals. It creates a pleasing fragrance that lasts from one grooming to the next. Scent refreshes instantly by wiping coat with a moist towel. Non-cholinesterase, ready-to-use formula. 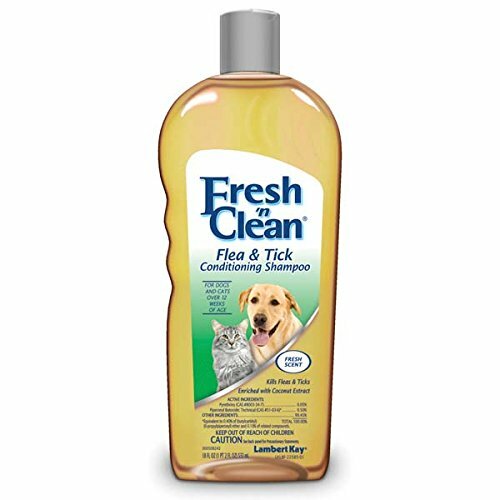 Fresh 'n clean flea and tick shampoo is safe for use on dogs, cats, puppies and kittens over 12 weeks old. Available in 18 ounce bottle. Ingredients are pyrethrin 0.05 percent, piperonyl butoxide as a synergist. Directions for use - Wet the coat with warm water. Apply the shampoo along the back of your pet and work the shampoo well into the coat. If it accidentally gets in the eyes, quickly wash them out with clean water to prevent irritation. Allow lather to remain on the pet for 5 minutes to permit the insecticide to take full effect. Rinse thoroughly. Measures 9-inch length by 1-4/5-inch width by 6-inch height.